This facility has four stations running ProTools software, with the capability of recording to digital media, CDs and DVDs. Students in "Audio Production," "Introduction to Radio Journalism," as well as those working on audio-for-video projects in other classes use this equipment. There are two dedicated sound recording and editing booths. This is where digital media and journalism editing classes are taught using Adobe CS software. Students learn to edit stories and design news pages. In addition, AVID software is available on each station. They also produce a campus magazine in this lab. This is where our newswriting classes are taught, as well as electronic media writing. Outside of class, students have access to Final Draft, Microsoft Word, Word Perfect and the Internet to complete their assignments. "Journalism 1" and "Journalism 2", "Feature Writing", "Public Affairs Reporting," and "Electronic Media Writing" are taught here. CSB 25 contains 10 Avid Media Composer stations complete with Adobe CS software, and CSB 55 has 16 stations. 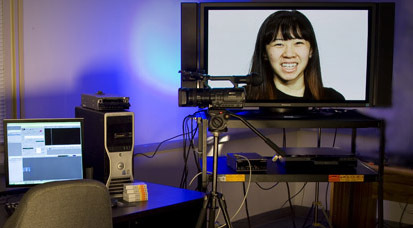 A large studio with three broadcast cameras with the Tri-caster virtual switcher and and green screen for post capabilities, this facility is used by the studio production class and advanced students who want to integrate such work with their on-location footage.